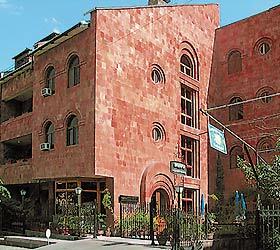 The Bass hotel complex is located in the prestigious Aygedzor district in the heart of Yerevan. This garden-like hotel is away from busy traffic and overlooks beautiful Mount Ararat. It is conveniently located only 20 minutes away from the airport, and just round the corner from the subway, major foreign embassies, the President Palace, the National academy of Armenia, the Parliament, the Writers' House. The Bass is the first private hotel in Yerevan. The hotel offers accommodation in comfortable rooms of different categories: Single, Double, Twin, Junior Suite, Senior Suite, Deluxe. Each room offers fresh fruits, a minibar, an air-conditioner, local heating, satellite TV (67 channels), international telephone, a bathroom or a shower, Internet access. Non-smoking rooms are available. The Bass restaurant offers a rich choice of both typical national and European cuisine. There is also a small and cosy bar here offering different drinks, cocktails and sweets. One of the most interesting places of the hotel complex is the wine cellar (Maran), which is decorated in typical Armenian style; it creates the special colouring of wine ceremony. Here guests will find the best sorts of wine. The following facilities and services are also available at the Bass Hotel: a sauna with a swimming pool, a 24-hour business centre, a souvenir shop, laundry and dry-cleaning services, car rent, excursion service, a hairdressing salon, a massage room, organization of conferences, buffets, banquets, seminars, translation service.